Since its launch in 2005, DivorceWriter has grown to be the leading online divorce site in the United States. DivorceWriter beats its main competitors in nearly every measurable category. The most online traffic from 2011 to 2014 (Compete.com, Semrush.com). The lowest price (June 2016 survey). The only BBB accredited company with an "A+" rating. 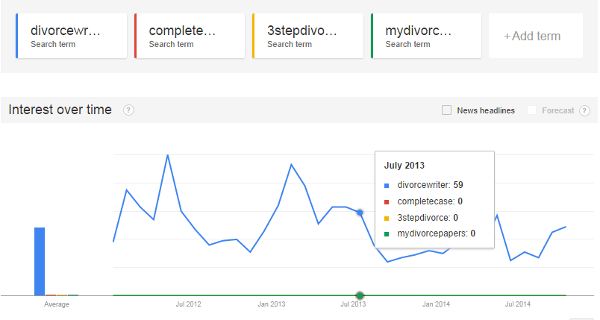 The most recognized online divorce business (Google Trends). Because of these measurable criteria, we conclude that more people have chosen DivorceWriter for their divorce papers than any other company for four years running. The most accurate way to determine who the competitors are in an ecommerce market is to see which companies appear in the search results for keyword phrases that are specific to the industry. 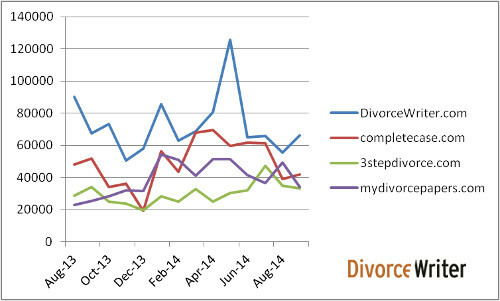 This table shows the main competitors in the online divorce market. 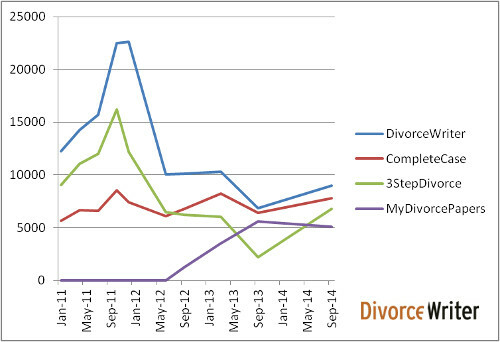 There are other sites selling divorce forms online, but Complete Case, 3 Step Divorce, and My Divorce Papers have appeared high in Google, Yahoo, and Bing search results consistently over the past few years. What about LegalZoom? Unlike the websites above, LegalZoom does not focus on "online divorce." The company does offer divorce papers, but it has put less effort into advertising divorces on TV or the internet than the sites listed above. Because it is not possible to determine the quantity of traffic it receives for divorce forms, and its apparent focus on other products, we leave it out of this comparison. At $137, DivorceWriter has the lowest price of the listed competitors. The law of supply and demand states that if potential customers are shown similar products, more of them will choose the lower priced product. No online divorce sites publish verifiable statistics on the number of users that visit their sites or how many divorces they sell each year. However, a good estimate can be obtained from companies that specialize in the collection of internet traffic data. Compete.com is a trusted source that collects data on the online behavior of millions of consumers. Compete's data is not 100% accurate, but it has proven valuable in comparing traffic sources. This chart shows the number of unique visitors to visit these sites from July 2013 to September 2014. Free Compete data only goes back one year, but Compete PRO users can view up to two years of data. According to the Compete data, DivorceWriter received the most traffic of these sites during this time period. SEMrush provides online competitor analysis software. It tracks Google and Bing ad position and natural search positions and provides key details on how much traffic websites receive from users using search engines. If SEMrush is tracking keywords that correspond to a particular industry, it can provide fairly accurate traffic data that goes back several years. This chart shows estimates of natural and paid search engine traffic since January 2011. The competition has changed over the years, but it is clear that DivorceWriter has been the consistent leader in traffic. *SEMrush has no traffic data for My Divorce Papers prior to July 2012. Google Trends can be used to compare how often a particular search term is entered relative to other searches over a period of time. This chart compares the Google Trend for each of the competitors' names since 2012. Only DivorceWriter had enough searches to be recorded as a Trend at any time during this period. Each of the companies except 3 Step Divorce is currently accredited with the Better Business Bureau. Pro Se Planning, Inc. (DivorceWriter.com) is the only one to have an "A+" rating and be accredited for more than 10 years. If you are going to complete your divorce papers online, you should use a company that is BBB accredited and has a strong reputation over a long period of time. If you have a problem with the product, you should first contact the company to see if they have a solution for your problem. If their solution is not acceptable, you can always request the BBB help resolve your dispute. The Advantage of Selling More Divorces than Anyone Else. At DivorceWriter, we know our customers' main concern is whether or not their divorce papers will be accepted by the court. Each state requires different forms and in many states the counties have different requirements. We put great effort in keeping our forms up-to-date, but constantly changing laws means that we sometimes miss something. The great advantage we have is that by selling more divorces than anyone else we get more feedback from customers than any other company. If a customer has a problem with our forms in his or her county, we fix our forms quickly so that future customers won't have the same problem. Lower prices, more traffic, and a 100% guarantee we honor every day have made DivorceWriter the leader in divorces online in year after year. DivorceWriter Reviews and Testimonials - See what our customers have to say.